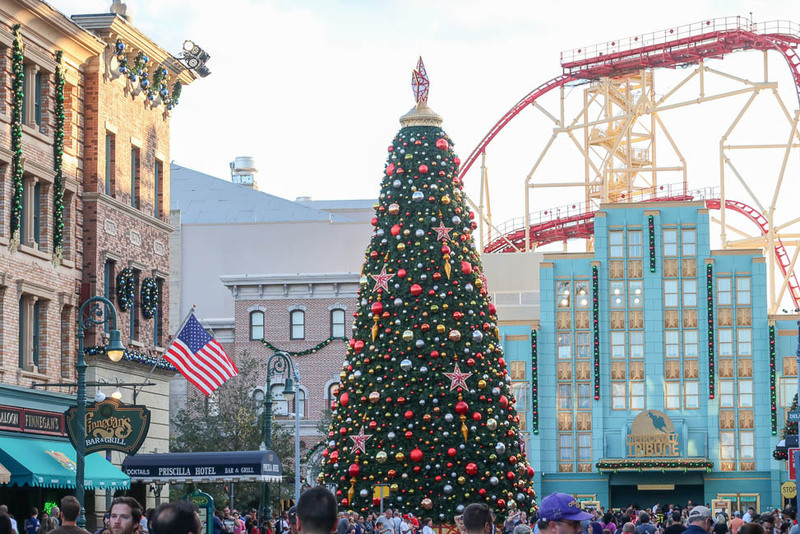 There’s nothing like the holidays at Universal Orlando. I’ve been going to Orlando on family vacations, girl getaways, trips with SVVs and long weekends with friends. I’ve been for Mardi Gras, for Halloween Horror Nights, for the opening of a brand-new water park, for summer vacation and in the dead of the winter. And I’d even been for Christmas before, but nothing tops Universal’s new holiday experience. 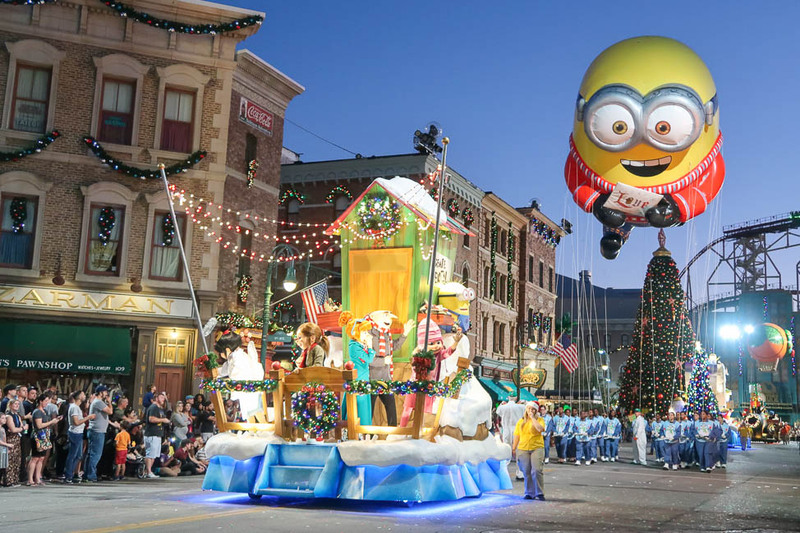 This year’s Holidays at Universal Resort launched on Nov. 18 and runs through Jan. 6, meaning you have plenty of time to factor it into your end-of-year plans! As part of my Blog Squad duties (tough job, I tell you! 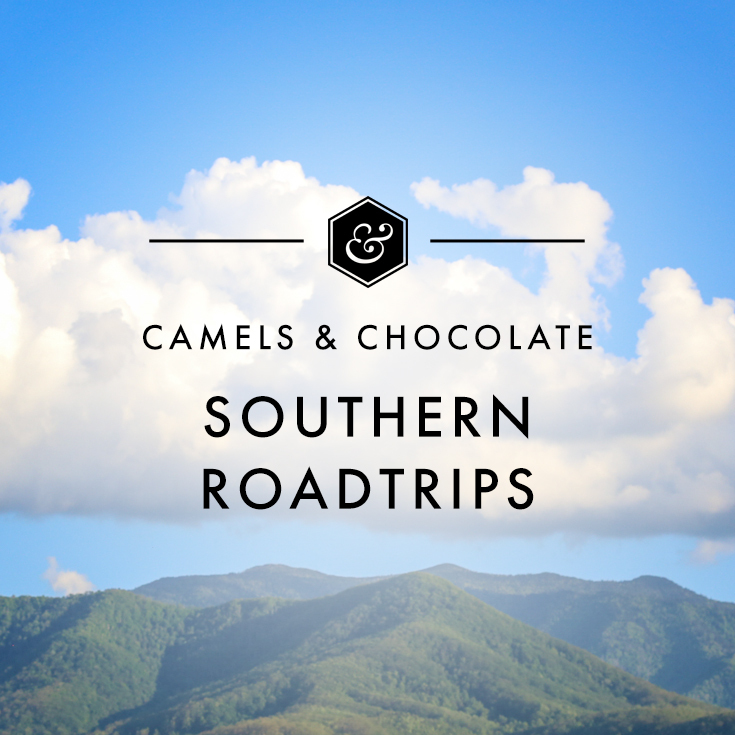 ), I spent this past weekend at the holidays opening with SVV and a number of my favorite traveling bloggers. 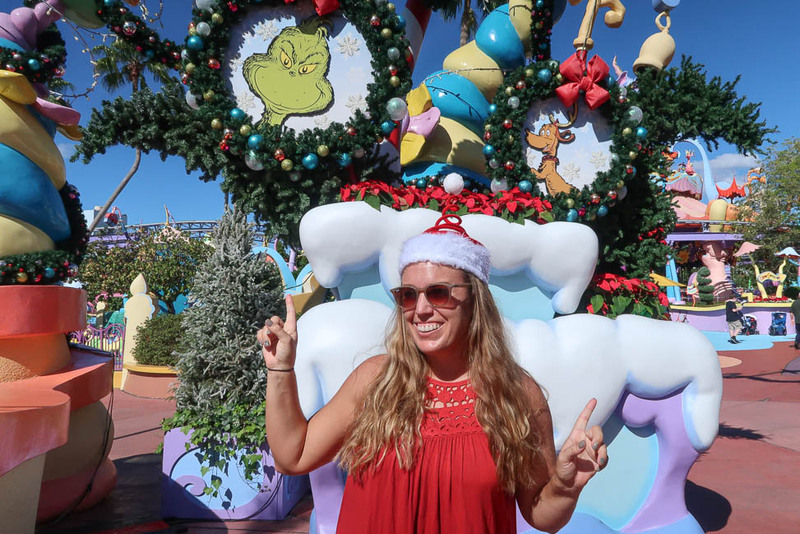 In the spirit of research, I rode all the rides, tasted all the hot butterbeer and racked up tips for how you can get your holiday cheer on at Orlando’s best theme parks. But aside from all its normal offerings—rides, pumpkin juice, mandrakes and more—Wizarding World in both parks absolutely comes alive for the holidays, with garland, decor and magic aplenty, and also a couple of specialty shows. In Diagon Alley, Celestina Warbeck and her Banshees take their usual performance and add a festive twist with original numbers from her award-winning Nothin’ Like A Holiday Spell album (you may have heard of it) such as “Accio Christmas” (which I guarantee you’ll go home singing) and “My Baby Gave Me a Hippogriff for Christmas” (I could only be so lucky to find one under the tree!). Meanwhile, over in Hogsmeade Village, the famed Frog Choir has their own Christmas routine that they perform several times a day with a handful of their own holiday hits. Pro tip: Arrive for one of their final performances and then nab your spot in front of the Castle for the nighttime The Magic of Christmas at Hogwarts Castle lights and fireworks display that starts at dusk and goes every 20 minutes. You’d be wise to arrive well before 5pm as crowds start forming early, and park employees rope off the area both from the entrance near Jurassic Park and the access point in front of Ollivander’s. 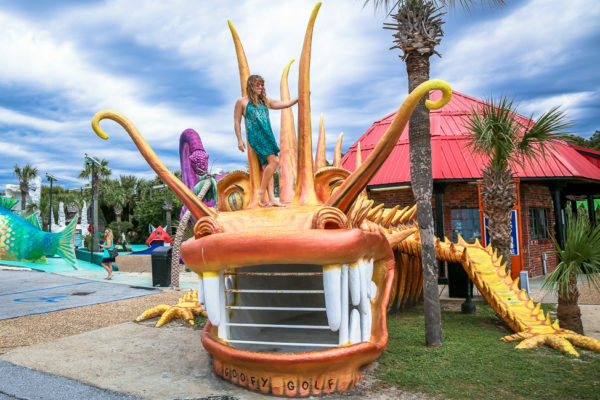 Check out Rachelle’s reasons to celebrate at Universal here. We didn’t actually make it up to the castle due to the crowds so we made our base near the entrance to the Hogwarts Express instead and climbed a couple steps to see as much as we could see. And, my favorite part, of course, is the food: There’s a twist on the regular butterbeer options! On top of regular, frozen and ice cream versions, you can now order hot butterbeer for the holidays, and it’s positively delightful! By far, the coolest part of the new holiday experience is the addition of a Macy’s-esque parade, complete with floats depicting many of your favorite Universal characters. There’s Gingerbread Man! There’s Donkey! There are MINIONS! And many of their cast members ride the floats below the towering balloons. The parade starts daily at 5:30pm, but I recommend getting there at 4pm to get your spot. Rachelle and I claimed real estate right in front of the Mummy, and several other Blog Squadders got some awesome shots from the end of Hollywood Boulevard. I love taking a stroll through Seuss Landing any time of year, but especially when it puts on its Christmas best. Seven years ago, my mom, sister and I drove down to Orlando from Tennessee to do the holidays at UOR with Angie and Rachel, so I’d already checked seeing The Grinchmas Who-liday Spectacular at Universal’s Islands of Adventure off my list. But for every Whos down in Whoville, the tall and the small, who has never seen the live retelling of the famed book before, it’s a spectacle worth witnessing! 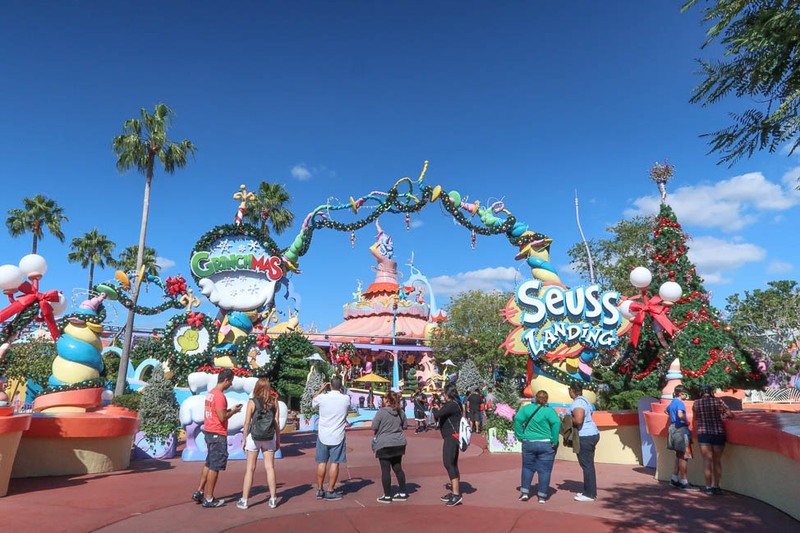 There are also Whos roaming about Seuss Landing and even an opportunity to mingle with the Grinch and his two sizes-too-small heart while you’re there. If you’re a huge fan of the green meanie, you can join him for The Grinch & Friends Character Breakfast in Circus McGurkus Cafe Stoo-pendous (price: $35 for adults, $21 for children). On many years, Universal has special holiday concerts on the Music Plaza Stage—we got to see Mannheim Steamroller, which really put us in the holiday spirit—so check the site to see what’s on while you’re visiting. No matter what time of the year you go, you want to avoid peak times, like weekends (duh), but also Thanksgiving and Christmas. Try to time it perfectly so you visit 1) on a weekday and 2) right before most schools get out for the holidays, and you’ll sail through the lines. The downside is that if you want to see special acts like past musical group Mannheim Streamroller, the concerts are typically only on Saturday and Sunday nights. You want to stay at the parks to minimize your time spent in transit and maximize your time in the parks. If you stay at any of the on-site properties, you’ll get early admission (i.e. an hour of park time all to yourself before the park plebeians flood the gates! ), and several of them also include an Express Pass in your stay. Personally, I’d choose the Hard Rock Hotel as it has the easiest access to the parks; you can walk to the entrance instead of relying on the water taxi. Park admission for Universal Orlando Resort is $110 for one day in one park or $165 for park-to-park. If you buy multiple days, the cost per day goes down (e.g. a two-park ticket for four days runs $72 a day). Outside of the Grinch character breakfast, all other holiday attractions are included in the price of the ticket. Florida residents always get special deals with a valid ID. If you’re not the park-going type in the heat of the summer, the Holidays at Universal Orlando are perfect for you! Y’all need to go for Thanksgiving one year!!! Aww! I just adore amusement parks. And I’m quite the nerd. I used to go to Disneyland Paris all the time, and that was way before our son was even born! I took him to Disneyland Paris when he was 5, and even though his eyes were huge, I was more excited than he was! We’ve also been to Amusement Parks in the US and they’re awesome, but far more expensive than they are in Europe! We recently went to Pleasure Beach in Blackpool, and can you believe that I went to the real Diagon Alley, which is actually in York – the real York – in Yorkshire! I’d love to go to Orlando one of these days, and then it would be the Wizarding World of Harry Potter for me! Have you done the HP studio tour in London yet? OMG this is so much fun!! I would love to visit Universal during the holidays! Thanks for the Black Friday tip too! Wonderful advice! Absolutely spectacular information and beautiful photos. I never would have thought about trying to get tickets and such on sale during Black Friday and definitely the timing of the trip. Planning it before schools get out for break and skipping all those potential lines is a phenomenal idea! 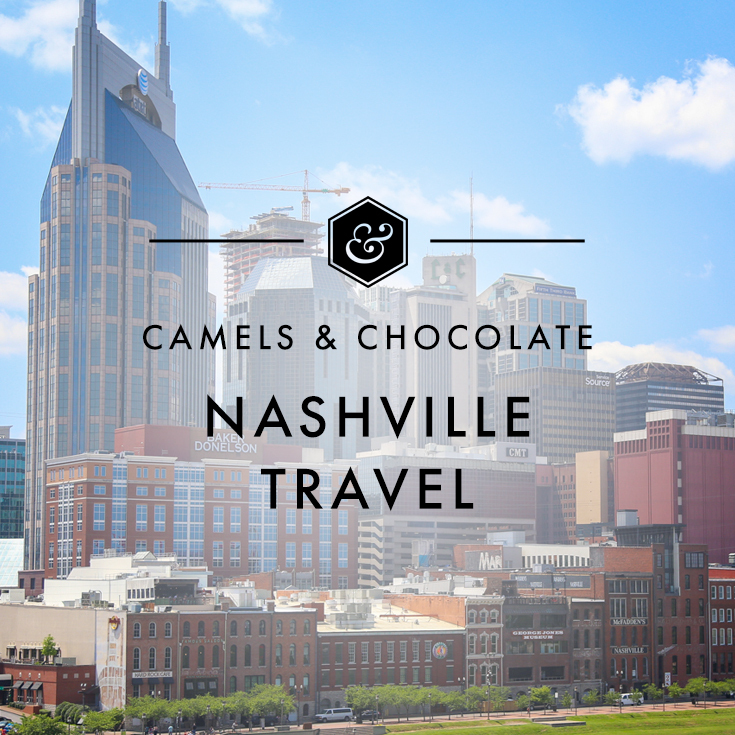 I didn’t quite realize how much changes came around there during the holidays, and can’t wait to go see it someday! I actually had NO idea UOR even did Black Friday sale until I was poking around their site for info! This post is so awesome, it made me want to jump out of bed and rip off my hip brace (did I mention that I just got out of surgery?) and get to Universal Orlando. I’ve been to the LA version but the Harry Potter part of Orlando Universal seems so much bigger. Plus I could also drink butterbeer for the rest of my life. Oh no, Katherine! Hope you’re recovering well post-surgery. Yes, Wizarding World at Orlando is MUCH bigger and definitely a sight to see, Christmas or not! My DREAM is to spend Christmas at Disney and Universal. I’m super jealous you got to go. This is definitely inspiration I need. Do it, Elaisha! I’ve never been on Christmas day, but I bet it’s an experience worth having! My family used to go to Orlando around Christmas time, but it got so crazy crowded over the years! Maybe Thanksgiving would be a better time to go. Pro tip: I’ve now been the weekend before Christmas prior to the schools all being out AND the Sunday/Monday before Thanksgiving, and both were relatively low in crowds. So I think the key is to get in right before the masses arrive. I’m not really big on theme parks, but my inner Harry Potter fan would totally love to visit the Wizarding World. Oh girl, you must. Anyone who is in love with the movies or the books will just be in awe of the level of detail they weave through both parks. Your photos are gonna make me cry! I’ve been wanting to visit Universal Studios for Harry Potter since forever. But for this Christmas I made a last minute decision to book a trip to Shanghai Disneyland instead 🙁 Now, I really wish I hadn’t! Such amazing photos! Incredible post! I love Christmas but have never thought of going to Orlando, in fact I am still yet to go to Orlando. 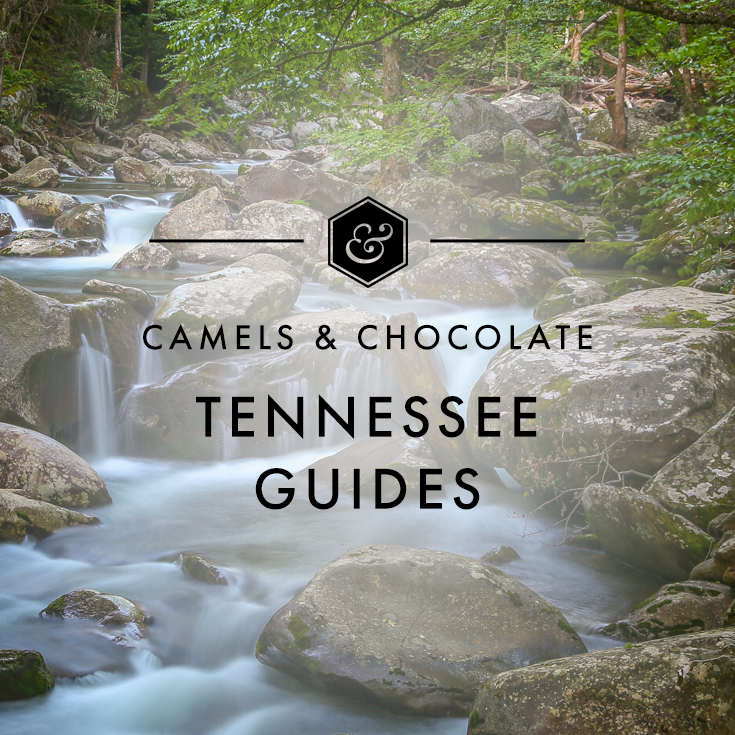 I’ve been wanting to go for years and as I am such a Harry Potter fan your video how made me rethink my Nashville and New England trips next year. The WWHP looks delightful all decked out for Christmas but you had me at hot butterbeer! I love reading your blog and very much excited as we are going to Universal and Disneyland coming December! It looks so magical from your pictures. Keep inspiring.